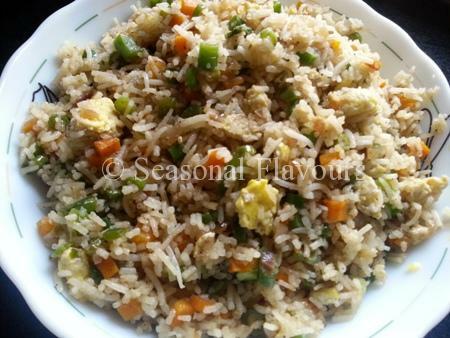 Egg Fried Rice with vegetables is a quick and simple dish, full of flavours and a complete meal on its own. The stir-fried Chinese rice dish is an all-time favourite. Veg Fried rice with egg is delicious and filling and holds a special place in my heart. Chinese fried rice with egg is a filling and delicious one pot meal. I’m a big fried rice fan and this Chinese rice preparation is so easy to make! Fried rice with egg is a great basic recipe that you can customize to suit your palate. It’s easy, quick and pleasing. Serve egg fried rice with sweet and sour chicken or chilli chicken. 1. Ever wondered how to make egg fried rice Chinese style? Well, it’s pretty easy. To make this simple Chinese Stir Fried Rice recipe, boil the rice till its 3/4th cooked. The rice needs to be fluffy and each grain should be separate. 2. Heat oil in a pan and scramble the eggs till almost done, but still slightly moist, and remove. 3. Add grated ginger, garlic and chopped onions and stir-fry on high heat. 4. Toss in an assortment of finely chopped vegetables (carrots, French Beans, capsicums, spring onions) and stir fry. 5. Tip in the scrambled eggs, seasoning and sauces and mix well. 6. Lastly, put in the rice and toss well so that it gets coated with all the flavours. 7. Serve Chinese Egg Fried Rice with Chilli Chicken. If you are looking for more rice preparation recipes, do try out Sesame Rice and Rice and Lentil Patties. Egg Fried Rice is a delectable rice preparation made with scrambled eggs and a medley of vegetables. Chinese fried rice with vegetables and egg is a unique way of using any leftover rice and veggies. Wash rice and soak in water for 30 minutes. Rinse and boil till ¾ done. Run under cold water and work 1 tbsp oil into the rice and leave it to drain in a colander. Heat ½ tbsp of oil in a pan. Break eggs in it, sprinkle salt and scramble. Remove and keep aside. Heat the remaining oil in the pan. Once it heats up, add minced ginger and garlic. Saute. Put in the chopped onions and stir on high heat till they turn translucent. Next add the chopped carrots and French beans. Sauté for 1-2 minutes. Add the chopped capsicums and stir well. Toss in a little of the chopped spring onions. Mix well. Add the scramble eggs. Combine well. Mix in pepper powder, ajinomoto, salt. Stir well. Add soya sauce, vinegar and chilli sauce. Mix well. Put in the rice and toss well. Sprinkle some chopped spring onions on top and remove. Serve Egg Fried Rice Chinese Style with Chilli Chicken. * For best results, ensure the rice is thoroughly cooled or refrigerate before cooking.